Pains au Chocolat, Banana en Caramel - Banoffee Karamel, easy with Danerolles! Nothing beats a delicious Pains au Chocolat. Or is there? This variation with caramel and banana is truly the definition of heaven. Pains au Chocolat a la Banoffee Caramel, it doesn’t get any better! Open the can and roll out the dough. Cut the cutting lines. Place the 8 pieces of dough horizontally in front of you. Put some caramel paste (or chocolate paste) onto the dough. Cut the banana in very thin slices and place onto the dough. Take the chocolate out of the packaging and place two pieces of chocolate vertically onto the dough. Roll the dough from each of the outsides to the middle. Repeat this for all the 8 Petits Pains au Chocolat. Turn the Petits Pains au Chocolat the other way round. 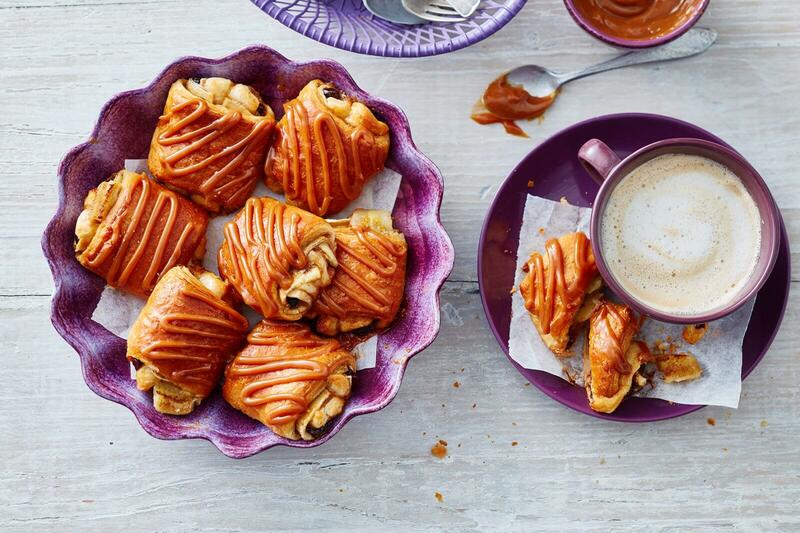 You now have your home-made Pains au Chocolat with banana and caramel! Mix an egg and brush the egg onto the dough to create a nice gloss. Bake the Pains au Chocolat for about 15 min. Pour some caramel sauce onto the Pains au Chocolat for your own Banoffee Caramel!